I am a clinical social worker who works at a short term psychiatric program where people come in to get stabilized. Many come in after a suicide attempt, etc. Every Friday I do a mandala session where I play Zen music to show them a way to quiet themselves and find a way to handle stress. I ofcourse always participate too and color along w them. When a friend of mine told me about this website, the really neat thing is that every week at work, I also talk about “Love Is Letting Go of Fear” book and tell them about how helpful the book is. You have taken two things that I believe are great tools for healing and put them together! Thank you! You’re so welcome! 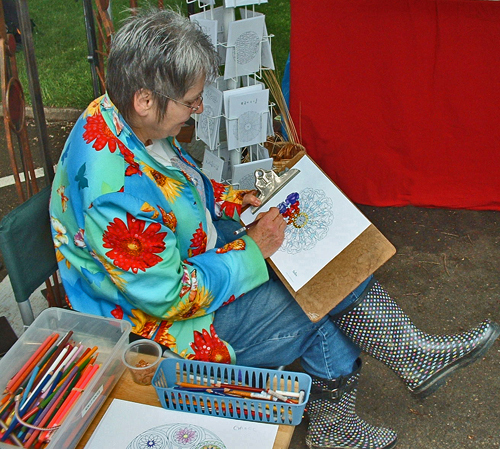 And thank you so much for sharing what you do…what a wonderful use of mandalas…they are so powerful and healing. I also offer a “Mandala of the Month” at http://www.MandalaoftheMonth.com which you may also find of benefit to you and the people that you help. Keep up the great service that you’re doing. You’re very welcome, Cindy! I’m glad these are of benefit to you and the people you help.